Akira Kurosawa (March 23, 1910 – September 6, 1998) was a Japanese movie director. Kurosawa's movies are liked in Japan. Kurosawa's movies are also liked by people in other countries. He made 30 movies in 50 years. He is thought to be one of the most important movie directors. In many of his famous movies, including Rashomon and The Seven Samurai, he worked with the actor Toshiro Mifune. Kurosawa started in the Japanese movie industry in 1936. Before he worked a little bit as a painter. After years of working on many movies as an assistant director and scriptwriter, he became a director in 1943. This was during World War II with the popular action movie Sanshiro Sugata (a.k.a. Judo Saga). Rashomon, was first shown in Tokyo in August 1950. On September 10, 1951 it was the surprise winner of the Golden Lion at the Venice Film Festival. It then was shown in Europe and North America. Because the movie was so well liked, it made people in the western world want to see more Japanese movies. This helped make other Japanese movie makers become successful. 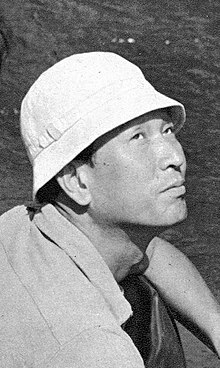 In the 1950s and early 1960s, Kurosawa directed about one movie each year. In 1990, he accepted the Academy Award for Lifetime Achievement. After he died, he was named "Asian of the Century" in the "Arts, Literature, and Culture" category by AsianWeek magazine and CNN. ↑ "BFI Features, Akira Kurosawa, a filmography". www.bfi.org.uk. Retrieved 2010-02-22. ↑ "Greatest Film Directors and Their Best Films". www.filmsite.org. Retrieved 2010-02-22. ↑ "Academy Award Acceptance Speech Database". Retrieved 2010-06-13. ↑ "Akira Kurosawa Tribute with George Lucas, Steven Spielberg". 2008-11-19. Retrieved 2010-06-28. ↑ "ASIANOW – Asiaweek – Asian of the Century – Kurosawa Akira – 12/10/99". Retrieved 2010-06-18.